A sea of colored-haired and red eye-shadowed teens filled The Masquerade's Hell venue Sunday, November 4th, 2018 for a packed Palaye Royale show as they kicked off their tour promoting their latest album Boom Boom Room (Side B). The young men of Palaye Royale have been playing The Masquerade for years as front-man Remington reminded us, but this year was different. After years of perseverance and playing to a nearly empty room, Atlanta showed them just how much we love them as fans of all ages filled the venue. Since their first studio album Boom Boom Room (Side A) was released in 2016, Palaye Royale has built a near cult-like fan base. Young followers immerse themselves in the lifestyle referring to themselves as Soldiers of the Royal Council. Inspired by the band's unique style the crowd itself was a work of art. The band portrayed themselves with a vintage pop meets punk flare sprinkled with a hint of mysticism as Remington, the vampire, Emerson, the pirate, and Sebastian, the gentleman represented their iconic eclecticism on stage giving their performance a timeless flare of mystery and oddity. 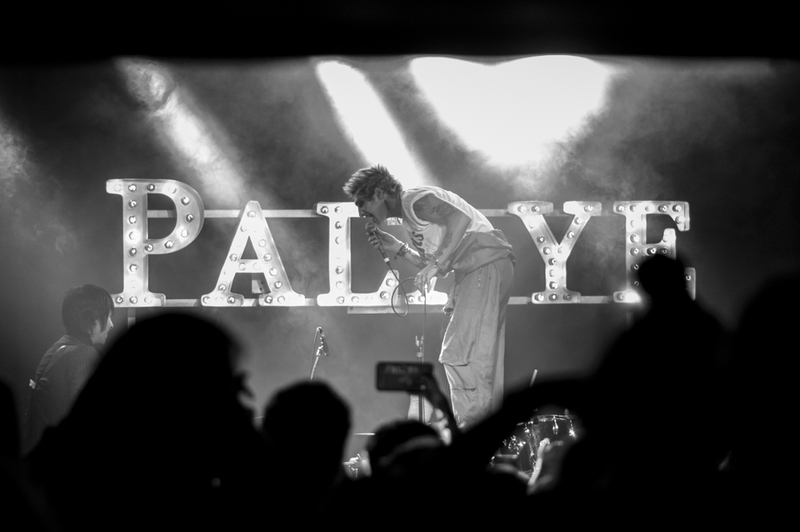 Palaye Royale has put extensive time and effort into creating a doting fan base. Their love for their fans was evident as the boys gave the crowd a show they won't soon forget. Sebastian's stage presence as The Gentleman is borderline irresistible as he swaggered around the stage strumming his classic Gretsch. The role of The Gentleman was only amplified by the ease at which he produced the band's iconic rock n roll meets classic punk sound while adding in the dark flavor and undertones of eclecticism. Even with a strong guitar lead, the band reaches a new level of intensity as Remington poured every ounce of heart, soul, and emotion that one man can muster into each bar he sang. While the all of this energy was being projected at the front of the stage and fans reached out desperately to touch hands with front-man Remington, Emerson kept the time as he drummed under the cover of his classic pirate inspired hat smiling a smile so infectious, even the parents who lined the back walls of the venue couldn’t resist. The attendance on Sunday was largely comprised of highly emotional teenagers who are facing struggles such as heartbreak and navigating the world as young adults. This theme was prevalent in most of their songs, notably “Teenage heartbreak Queen.” The song was prefaced with a sentiment about how close this song is to writer Remington's heart. As the title clues, it is a song about young heartbreak, something we can all relate to. It was cathartic to witness the song as a bystander. Knowing what young heartbreak feels like, and seeing how something so painful can be celebrated with those going through similar issues allowed for a sense of togetherness that permeated the young crowd. By writing and singing about things such as this, we, as fans, are able to take something devastating and turn it into a jubilant experience as hundreds of people rejoiced in sharing similar emotions, even Remington had a smile on his face as he sang the bitter lyrics as it was evident that we are never alone in our struggles or our heartbreak. On a more rambunctious note, a Palaye Royale show wouldn't be complete without a stunt. Remington in notorious for climbing through venues. Near the end of the show, Remington gazed up at the balcony and promptly jumped from the stage to grab a hold on the balcony railing and pulled himself to the upper level. Fans screamed in excitement, desperate to graze his skin as he passed by. As he made his rounds in the above balcony he eventually had to make it back to the stage naturally refusing the stairs, he hopped the rail and dropped into the crowd below before making his way to the back to the mic stand. The future is so bright for the boys of Palaye Royale as they display the makings of true stars. Their music has a distinct style blend and their fan base continues to grow with each passing day. With their tour only beginning, now is your chance to see them as they make their way to global fame. Their tour will extend until the end of February. Check here to catch them in a town near you!